This December, Achaogen released much data on 2 plazomicin trials: the pivotal EPIC study comparing plazomicin / levofloxacin with meropenem / levofloxacin in cUTI is the one we want to look at today because it is interpretable, while the other trial called CARE is not. CARE is one of those observational “studies” which are too small (20 patients per arm), too messy and too poorly designed to draw any conclusions. We gladly refer this CARE trial to the care of a qualified FDA reviewer with superior analytical skills and more patience. Plazomicin performed as well as meropenem / levofloxacin; the overall response rate in the plazomicin arm was 88% at Day 5. Activity against ESBLs was better with plazomicin than with meropenem. In the TOC analyses, plazomicin / levofloxacin was statistically superior and Achaogen folks became all excited about this. The safety of plazomicin, an IV aminoglycoside, was quite good according to the presenters at the web conference call. Was it really? Half the patients had a relatively short 5 day exposure to plazomicin the other half finished the entire treatment course (7-10 days) on plazomicin IV therapy. Such short exposure times to an aminoglycoside are usually safe, although S-creatinine slowly starts creeping up after a few days, as it did in EPIC. Of concern is certainly the patient whose Clcr dropped from 62 (i.e.,normal) to a Clcr of 22 after the 1st dose of plazomicin. Let’s face it: plazomicin is an aminoglycoside, and it behaves like one, too. However, the EPIC presentation made us think about a few things we wanted to run by our readers today. With both arms using levofloxacin as the PO step-down drug, we would think that the primary efficacy analysis should be based on the study drug effect (CR and BR) at the end of IV therapy (EOIV), and nothing else. Evaluations from a later time point reflect the combined effect of plazomicin IV AND levofloxacin PO; outcome determinations after EOIV clearly cannot be attributed to plazomicin alone and should therefore not be part of the 1o efficacy statistics. Unless labeling in the Package Insert specifies that plazomicin “has to be combined with levofloxacin” for the treatment of cUTI. In which case we should rather refer to it as ‘Plazofloxacin’ or ‘Levomicin’. Of course, in the same cUTI patient population, one could have just used levofloxacin IV/PO and obtained the same results. 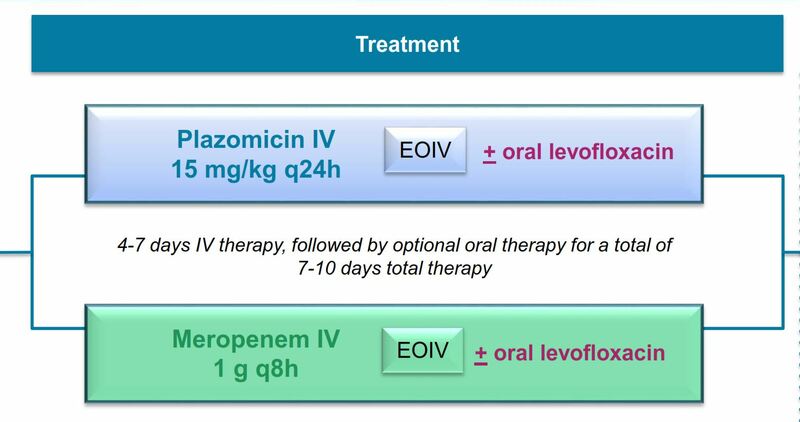 EPIC, however, shows us convincingly that plazomicin is an effective replacement for IV levofloxacin (or meropenem), just a bit more toxic and in need of TDM. Maybe our logic has become a bit warped by listening to too many FDA sessions with hair-splitting arguments about study design but we certainly recall hearing it stated by the Agency on numerous occasions that even a single day of a non-study drug can ruin the efficacy evaluation. Figures! Our second issue is the large number of microbiologically non-evaluable patients in EPIC. Of 609 patients enrolled, only 388, i.e., not even 2/3, were valid for the key mMITT analysis. The presenters informed us that 1/3 of patients enrolled did not even have a (valid) urinary pathogen at entry. Unfortunately, Achaogen is not alone, other companies did not fare much better in their cUTI studies: The Medicines Company reported a similarly low yield in its carbavance study (mMITT = 68%). The ceftolozane / tazobactam trial looks golden despite a rather low mMITT rate of 73.9%. When it is so easy to test for significant bacteriuria by doing a dipstick test for nitrite and leukocyte esterase, why then are there so many non-evaluable patients in these trials? We assume that exclusion of urinary isolates not susceptible to study drugs is the reason. In the case of the EPIC trial, we were dealing with 3 antibiotics to which a pathogen had to be susceptible in order to qualify for validity. So here is our next regulatory question: If plazomicin is approved for cUTI based on the results of a single trial – the EPIC trial – which preselected patients for plazomicin, meropenem and levofloxacin susceptibility, will the drug only get approved for cUTI caused by triple-susceptible uropathogens? Can somebody please tell us again why we should use plazomicin in such patients, when less toxic alternative antibiotics (including IV and PO levofloxacin) would do the trick? Ah, regulatory thinking can be so confusing and may have led us astray again. The yin/yang of Sophism and Sufism, the logical and the mystical, are so close together. Let’s get over it quickly and congratulate Achaogen for a job well done. Let us perhaps welcome plazofloxacin to the club of cUTI antibiotics that did better than comparator. Maybe the penems are just not as potent any longer as they used to be. In case you missed it, cefiderocol recently showed superiority over imipenem. However, this was a fair comparison of IV drug vs IV drug, without a PO step-down to another antibiotic that could have influenced the results. Looking disappointedly into the cUTI rear-view mirror: it seems certain now that eravacycline was inferior in the IGNITE2 trial because of a poorly absorbed PO formulation. Tetraphase is working on a replacement for it. This entry was posted in QIDP Antibiotics, The News, The Viewpoint and tagged Achaogen, antibiotic blog, ASPECT-cUTI, carbavance, cefiderocol, ceftolozane/tazobactam, complicated UTI, CORE trial, cUTI, EPIC trial, eravacycline, FDA cUTI Guidance, Harald Reinhart, IGNITE2, imipenem, Levaquin, levofloxacin, meropenem, Merrem, mMITT, patient validity, plazofloxacin, plazomicin, Primaxin, S-649266, Shionogi, TANGO-1, TDM, Tetraphase, The Medicines Company, therapeutic drug monitoring, Zerbaxa by Harald. Bookmark the permalink. What is cefiderocol? Do you have a reference for this interesting news? Thanks for the feedback – appreciated! Cefiderocol is S-649266, a novel Shionogi cephalosporin with activity against many MDR Gram-negatives. Here a recent reference: http://www.prnewswire.com/news-releases/shionogi-announces-positive-top-line-results-for-cefiderocol-pivotal-cuti-clinical-trial-300389912.html. I know that Shionogi’s siderophore-cephalo but did not know its generic name. Thanks! Agree with you that the efficacy and safety of IV eravacycline should hold up against cUTI. However, I am not sure whether it is smart to set a high daily price ($1000/day) for eravacycline and plazomicin unless they don’t mind being kept in reserve as 3rd tier antibiotics, on few formularies and with significant use restrictions. Remember, fidaxomicin priced itself out of competition when it came out with premium pricing; subsequent price corrections never undid the initial damage.